Maggie and her three companions, Mara, Ruby and Lulu entertained guests at ARK 2000 in celebration of Maggie's first anniversary with new friends and adopted family. The elephant celebrants were served special cakes made of bran, raisins, molasses and decorated with Maggie's favorite treats, Jolly Ranchers and Jelly Bellies. The four party girls also indulged their enormous appetites with edible treat bags filled with popcorn, raisins, artichokes and bananas. A group of Maggie's friends and supporters, including Buck Buchanan from Travis Air Force Base, celebrated the day with cookies, cider and a special birthday cake for Buck. We learned that Maggie flew in from Alaska on Buck's birthday last year. What a birthday present! 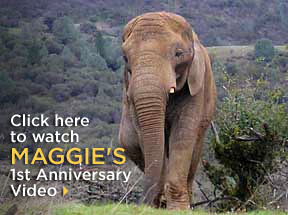 Without Buck and all the men and women from the Anchorage and Travis Air Force bases, Maggie would not have been here to celebrate her first year in California. Maggie's good health and good spirits as she meandered around the other elephants, stealing a pine tree from Mara and sharing peanuts with Lulu, were the main topic of conversation. Her rescue is an inspiration to all and a celebration of the power of love and determination. A big thank you to all Maggie's friends and supporters! To make a donation for Maggie's food and care, please select the Donate button.